Your Subpage Fullwidth Sections and Index.php (home page) allows up to 7 content sections to be assigned to a page and can contain text, images, etc. These sections will display under the main content of the page. If you are adding a new Section, below is some guidance and information about what each field is and how it works. Content - This is the main content block and resembles the content/styles of other page content. Background Color - Selecting this option will make the section display with the alternate background color. Background Image - This serves as the section background image. There is no set restriction on images and the recommended size will depend on the amount of content and/or if you are using the parallax option. For parallax background images, a good width is somewhere around 1600px (for retina images you can use 3,200px in width). Column Slugs - This field allows you to have a two column container that spans the width of the template. See below for more details. 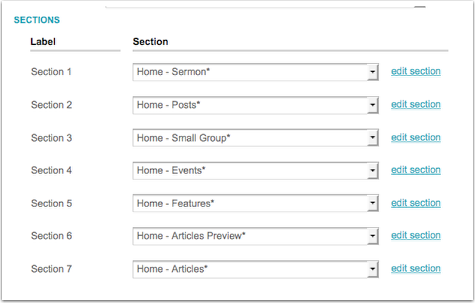 Content Feature - Entering content in this editor will replace the main section content and display the content in a smaller area with a light background. This section should be used with the "Background Image" option. Dark Background - Selecting this checkbox displays the content in white on top of the site default dark section background color or background image. Parallax Background - This option turns the background image into a parallax background. This field allows you to place two sections next to each other to create a two-column full-width custom section. If you want to use this option, this field must have two section slugs, one for each column. representing a section. A slug is the name of the section in lowercase with dashes in place of spaces. An example is on the home page for the section labeled "Home - Features," which has two section slugs in this field. You enter the two slugs separated with a comma, like this: "home-newsletter,home-twitter". These sections can contain background images, text, Monklets, etc. 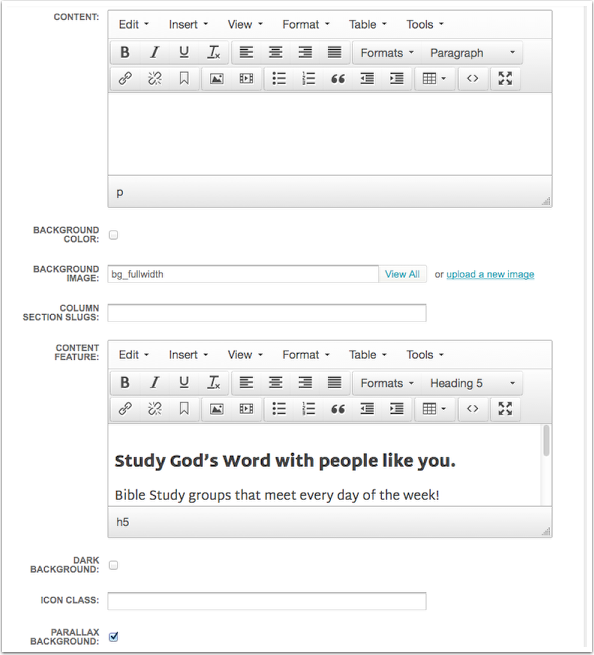 Icon Class - Entering an icon class will display that icon between the section title and content. See Icon information in the Designer Guide section. Note: The icon class for sections only displays for the column and sidebar sections.